Ruth talks about why she likes raisins. Todd: Hey Ruth, how’s it going? Ruth: Fine, thank you. I’m fine. How are you? Todd: Good. Now Ruth, I was noticing that you are eating raisins. Todd: What is it with the raisins? You always have raisins! Ruth: I really like raisins. They’re so nice. They’re so practical because you can take them anywhere. It’s not like if you take other fruits with you: they squash and they bruise but raisins are so handy and they come in a little packet and you can always have fruit with you. Todd: That’s a pretty good point there actually but still, I mean, all the time? I see you with raisins every day! Ruth: I eat raisins every day. I really like them. Todd: Don’t you get sick of them? I mean eating them every day? Ruth: I don’t ever get sick of things like raisins or broccoli for that matter. I could never get sick of it. Todd: Well that’s strange. What about grapes? Because you like raisins do you like grapes? Ruth: Actually I prefer grapes. Grapes are probably my favourite fruit but they’re not practical. You can’t carry them around with you and they’re heavier and they’re more expensive as well. Raisins are cheap. Todd: Have you ever noticed that grapes, at least when I eat grapes, my mouth gets a sensation (not the taste) but something about the texture of eating grapes: my mouth gets a sensation that no other food gives me? Ruth: Yeah that’s true. I don’t know why that is. Do you think that’s because its slightly acidic maybe? Ruth: I don’t know but I like it. Todd: Yeah, grapes are great. Actually where I’m from in California it’s a big producer of raisins. Ruth: Oh yeah that’s right and you can get raisins in little red boxes can’t you? Todd: Yeah. The thing is, I love raisins but not just plain. Eating raisins just doesn’t do it for me but I love raisins in my cereal. And I love raisin bran. Best cereal ever made. Ruth: I really like it too. Todd: And I love raisins in cookies and raisin bread. Ruth: I don’t think I’ve ever had raisin bread. Todd: What? You’re like a big raisin fan. And you’ve never had raisin bread? Ruth: I don’t think so. Is it like a teacake? Todd: No, it’s just like a sweet bread with raisins in the middle. Ruth: No, I’ve never had that. Todd: Well I’ll find some raisin bread and I’ll give it to you. Ruth: Oh you’re a star, thank you. It’s not like if you take other fruits with you: they squash and they bruise. The banana was very brown and bruised from being in my purse. When I bought the apple I didn't notice that half of it was bruised. 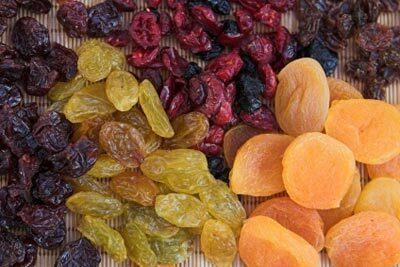 Raisins are so handy and they come in a little packet and you can always have fruit with you. Frozen dinners are handy if you don't have time to cook, but they aren't delicious. It was very handy to have a shop that sold vegetables near my house. Don’t you get sick of them? I mean eating them every day? I have nothing to wear. I am sick of all my clothes. After three months in Mexico, he was sick of tacos. When I eat grapes, my mouth gets a sensation. I hate the sensation of eating sour foods. She had the sensation that she was being watched. He is angry now, because he was deprived of love as a child. I'm on a diet, and I feel deprived of sweets.